In order to fully understand my perspective regarding my work, I think it is helpful to see where I've been and what I have done. This particular part of my website is highly personal. I grew up in a middle class suburb of Columbus, Ohio in the 1980's and 1990's. My favorite activity was going out with the boys and mucking around in the local creek (mainly tributaries of Blacklick Creek). In high school I was an athlete, scholar and artist. I loved biology but I was infatuated with art. My first year of college was at a small private college where majored in art and attempted to play college soccer. I worked my first job at Jack's Aquarium & Pets while living with my parents and commuting 30-some minutes to class each day. None of those activities worked out the next year. I decided to transfer to The Ohio State University to save on tuition and switch majors. However, I missed the deadline for admissions and defaulted on a huge school loan. My meager wage was garnished and at age 20 I was inducted into the "real world". I learned the hard way how to juggle finances, feed myself while maintaining a healthy lifestyle, eventually maintain a fulfilling relationship, and deal with people and situations. To live on my own and pay off financial debt I needed a better paying job. I started working for Aquarium Adventure, which is a fish-only pet store. I loved working there. Customers would come in and say it was better than the Columbus Zoo. Many younger people working at the fish store were in a similar position to myself: on their own and trying to get back to school. This is where I met my husband, Daniel. At this point I became a lifer in the world of fish. While I was happy to begin a biological interest in fish, retail had warped my impressionable mind. I had pipe dreams of staying with the company, setting up stores, flying around the world to conventions and making a comfortable amount of money. One year after leaving college, the trap had been set for me to never return to school. While working retail, I was writing online articles for AquaScaping World Magazine (Stocking a Nano Aquarium & Urban Water Gardens) while maintaining the position of Secretary of the Columbus Area Fish Enthusiasts. Eventually I became sensitive to larger issues surrounding the pet trade and conservation. My position at that specific aquarium store threatened these ideals. Furthermore, the job position and the hours I worked were keeping me from going back to school. I stepped down and accepted another position at a smaller aquarium store, Byerly's Aquarium. As it turned out, Byerly's was worse. My pay check would bounce every other month and the business was headed downhill quickly. I started taking classes at Columbus State Community College to get back into being a student while still living on my own. Money was necessary since day one and with my paycheck bouncing, I had to find another job. With classes during the day, finding a flexible and well paying job was difficult. I applied to work for the FedEx Ground facility as a third-shift package handler. The pay was excellent and the hours allowed me to attend class. I worked at FedEx and attended Columbus State until I felt comfortable enough to transfer to Ohio State. I worked 3rd shift: left for work at 11PM, worked until 4AM or longer if it was a holiday, came home slept from 5 AM until class, went to class, studied, and repeated the process five days a week. My car sometimes doubled as a bed if I had an early class. On those days I would bring workout and school clothes, food, and school work for the day. I had to be very well organized and think 10 steps ahead. There was a learning curve- sometimes I would forget clean underwear or a book. However, I learned how to juggle many things at once and plan very well in advance for activities. Although I was staying afloat financially, academically I was fighting a losing battle. I needed to keep working third shift to take the classes I needed. The hours I worked made it very hard for me to study, do group work, or sleep during the night. College was supposed to be hard so I sucked it up and dealt with it. After a year and a half at FedEx, I was promoted to Part-Time Service Manager. I am a competitive person and enjoy the challenge of finding efficient ways to complete tasks. FedEx was all about competition, efficiency and a large dose of mental toughness. I was one of a few women who could handle that kind of work environment (20% female). It was rough, but I loved it. I gorged myself on responsibility and ran an area that won accolades for service and safety. I had to work weekends and holidays with no air conditioning or heat but the job satisfied me in many ways. It taught me how to talk to people, manage situations under tough circumstances, take constructive criticism, and basically fend for myself. I worked 3rd shift and attended class for another 2 years. Eventually I switched to second shift to finish my upper level classes. Working a normal shift was like entering a whole other world. My dismal grades began to improve and I became more interested in my field of study (zoology). I worked for the Museum of Biological Diversity at OSU in the Borror Lab (Columbus Dispatch Article) and volunteered at the Open House for several years under the guidance of Dr. John Wenzel. Explaining the symbiotic relationship between clownfish and sea anemones. Museum of Biodiversity; The Ohio State University Photo by Tony... something from Dr. Daly's Lab. Find this mis-attributed photo credit and I'll give you $1. I jumped headfirst into ichthyology in 2009 when I was accepted into the Center for Study of Invasive Species and Small Population's REU program. It was my way out of a FedEx career and a huge opportunity for me to start a career in research. My position was to help a graduate student study the effects of impoundment on steelhead (Oncorhynchus mykiss) kelt at the University of Idaho (Moffitt Lab). Eventually, my REU project changed from working with steelhead to studying ways to limit the spread of the invasive New Zealand Mud Snail, Potamopyrgus antipodarum, which is problematic in the Pacific Northwest. The grad student I was working with, Kelly Stockton, recently finished her thesis and information on our work can be found here. I finished my REU at the end of the summer in 2009. While I was in Idaho, Daniel decided to drive from Ohio to pick me up so we could spend a week driving back doing what we love- camping, hiking, and exploring. As avid backpackers and outdoor enthusiasts, we fell in love with Wyoming and the Pacific Northwest several years before. The trip home was going to be a special treat to end a fantastic research experience. We backpacked through Grand Teton National Park. He must have winked at the park ranger who granted us back country passes because we were given special permission to camp at the ranger's favorite spot near Lake Solitude called Mica Lake. It was one hell of a hike but peaceful and beautiful. Our engagement photo! Dan and I at Mica Lake in Grand Teton National Park (2009). Photo by a pika. I returned from my Idaho adventure with a new found purpose for research in ichthyology. I hunkered down and began to plan my next step: applying to graduate school. Dan was taking courses at Columbus State Community College in order to get the "easy" courses out of the way. We decided wherever I ended up for grad school, he would continue and go on to get his Bachelor's degree. Luckily I was able to get a part time job working at a marine-only aquarium store called Phishy Business (RIP; circa 2015) in Gahanna, Ohio. I worked part time and went to school full time to finish my upper level (and harder) courses. Dan was still working while taking classes and we were scraping by. After lots of help from some amazing mentors (such as Dr. John Wenzel and Dr. Meg Daly at Ohio State), I successfully applied and got into a graduate degree program! I was accepted into Dr. Kyle Piller's ichthyology lab at Southeastern Louisiana University in Hammond, Louisiana! I would be working on my Master's degree. Looking back, I am absolutely dumbfounded that I went from being a lifer at a fish store to studying fish in graduate school! If you are one of those people stuck in a job, passionate about what you do, but not knowing how to move forward- you CAN do it. It will take patience, effort, and a lot of work but it can be done! I'm always willing to mentor anyone who needs it. It was not an easy journey for me since I am a first-generation college graduate. The process is not easy and very confusing. In Spring 2010 I graduated from Ohio State University with my Bachelor's of Science in Zoology. 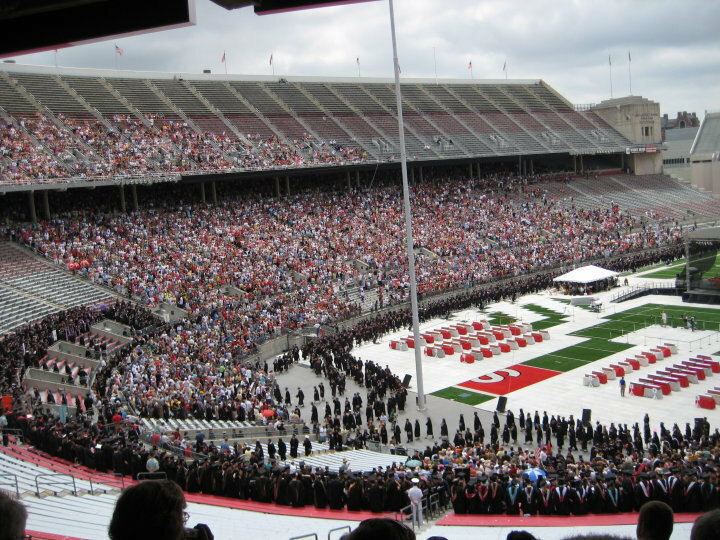 Filing in for the graduation ceremony in the Shoe (2010). Then, a few months later on July 23, 2010, I married my favorite person and friend, Dan Powell. In front of our immediate families and a few friends we were married in the Olentangy River at High Banks Metro Park. Dan's dad passed years earlier but they released his ashes further upstream in the Olentangy - he was present in spirit! Married in the Olentangy River at High Banks Metro Park in Columbus Ohio. Onward to Louisiana we went! I was asked many times why I wanted to move to Louisiana, and my answer was "This is where I got into school". However, once situated there it became my second home. Not a day goes by where I don't miss the welcoming people of Louisiana. Graduate school there was interesting. I was at Southeastern Louisiana University in the biological sciences, which only had Master's graduate students and post docs. There were no PhD students; however, they made up for it and took their MS program incredibly serious. I took prelims, both written and oral, got two publications from my 2 years there, and graduated after defending a 45 minute seminar I gave to the entire department. It was challenging. During this time Dan finished his Bachelor's and did research for Dr. Piller. He now has 2 pubs from his work in my lab- as I said: productive! From here Dan and I both wanted to pursue our PhD's in fish-related fields. In 2012 we settled on a nicely funded set of programs at Texas A&M University in College Station. Year one of my PhD was not pretty. My husband and I grew apart under the pressure of conforming to the scientific culture. That along with work-life balance issues, miscommunication, and pressure from ourselves, we broke. It's a long, personal, embarrassing story from there. Today, March 16, 2017, about 4-5 months after initiating a break up with my husband, I am surviving. I switched departments after year 1 and have been a social scientist since. I love it. It's different but more suitable for me so far. The only problem is the love of my life is no longer in my immediate life. Texas is far from home and as a grad student, your friends slowly decline in population until you yourself leave. It's been hard. Both Dan and I blame the PhD process for our break up. Do not discount its effects on you or your loved ones. They need love, comfort, support, and ego strokes for 4-6 years. Plus the uncertainly of life on top of that. Do yourself a favor and think long and hard how this process will effect you and your loved ones; it's not for everyone, regardless of your skill or knowledge. Ask me if you want to know more about this; I'm willing to share my story.